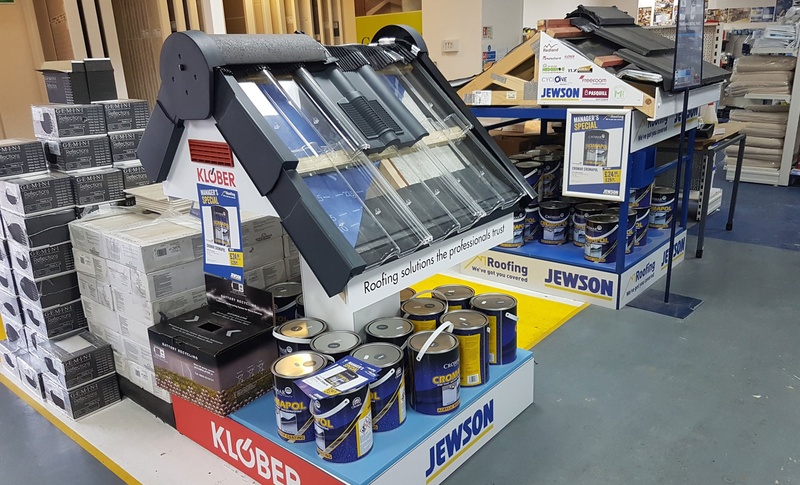 The roof was raised when Klober presented us with the opportunity to design and build a bespoke retail display solution that would make an impact within builders’ merchants. Devising a design that would encourage customer engagement. Ensuring the attractive elements of the roofing products were highlighted. Doing both within a 1m x 1m space! The project was very much design-led and we liaised with Klober on the development of various creative approaches. Interchangeable graphics for multiple products, promotions, and offers. Eight different products on the same display. We also used our practical innovation skills to construct a POS display stand that was suitably robust for its intended environment and the products it would hold. (Above) The Klober bespoke retail display stand (with another we created for Jewson in the background). The finished retail display stands gave Klober a prominent brand presence in the compact merchant environments. “Getting display space with any of our building merchant customers is never easy and we are often competing with other suppliers for the opportunity to display our products,” said Andrew. Each of the 50 displays was completely assembled on our premises before being placed in the appropriate position without disruption within 50 merchants across the UK. Fulfillment of the showroom display project was completed within a three-week period, with all elements managed and delivered by members of the Merit team. Lets create a success story for you!